I suffer from early rising insomnia and usually give up trying to go back to sleep and read instead. Last night I read two of the above and read enough of the third to realize I had already read it. Deadly Advice is a cozy mystery series I have wanted to read for a while. I grew up with a fascination for Dear Abby and advice columns in general. I read Dear Abby with breakfast almost every morning and always turned to the advice columns in all my mom’s magazines…Can This Marriage be Saved…dun dun dunnnnn. 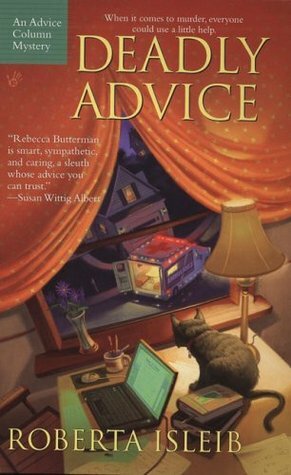 I really liked the main character here, Rebecca, a psychologist who also writes advice columns. Her neighbor commits suicide or so it seems and the victim’s mother begs Rebecca for help proving it isn’t so. The characters are really well done and the take on the mental health issues make for an interesting backdrop for the mystery and the side plots. The mystery has multiple twists and suspects with very probable motives to make it challenging to solve. This series is, to my knowledge, discontinued, which is really a shame. Very well written and really quite fascinating, it is a great addition to the cozy mystery genre. Deadly Advice has been released on Kindle and that is how I bought and I hope the other couple will be released that way as well. I think that perhaps this series suffered from that fact that it didn’t quite fit into the cozy mold. The sleuthing uncovers lots of alternative sexual practices and on top of that the book deals with mental illness and suicide, perhaps it was a little dark for readers looking for the typical cozy? I really enjoyed it and would highly recommend it. 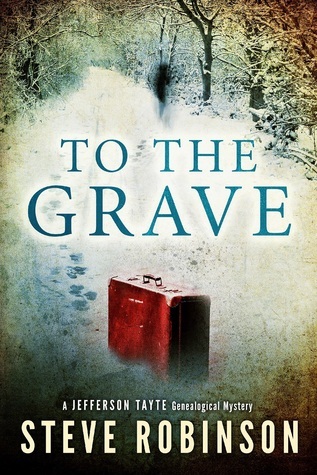 To the Grave is this month’s read over at the Kindle English Mystery Book Club on Goodreads. I read this one with some trepidation as it had been put forth as a WWII book and I have to say that is a period that I usually never read. I am happy that I did decide to participate and read it. The WWII elements are just one part of a story that flashes back and forward. The flashes are done well, so the reader doesn’t get lost and can keep the story lines straight. The protagonist is a family historian/genealogist who is looking for an adoptee’s missing mother, Mena. We learn what has become of Mena and her Danny, in bits and pieces revealed through letters and flashbacks. Meanwhile, there are deadly forces at work that do not want Mena’s story and all the secrets exposed. The murders continue as the search for Mena becomes more desperate. The ending resolves all the bits and pieces very nicely, albeit sadly. I enjoyed To The Grave and would be interested to read more by the author. I have read other books, out of order, by Karin Fossum. I picked up this one, Don’t Look Back, and started to read it and almost from the outset recognized the book as one I had read in the past. I couldn’t quite remember the resolution so I skimmed through until it came back to me. Fascinating excellent example of Scandinavian crime fiction, I can’t wait to read more in this series.